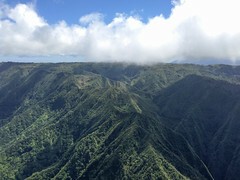 After Saturday's record breaking flight from Kahana, I was just happy to get out and fly on Sunday. But when five of my XC buddies joined me out there, I thought maybe we should try and go somewhere! I suggested we aim for the golf course. I shared a few of my tips from past trips, and I was hopeful that we could get a bunch of people there. (Only FlyStrong has been there before.) Jim and McStalker stayed local, but I rallied Woody, Thom and FlyStrong to go the distance. After a quick detour to Kualoa and back, I came back and encouraged the guys to take the infamous left turn. Woody and FlyStrong went first, followed by me and Thom. I waited a very long time for Thom to scratch his way up and join me. But it was worth it. It's always more fun flying with your buddies. We chased Woody and Bill up to cloud base over Sacred Falls, frolicking in the wispies and the most gorgeous afternoon light. We cleared 3,200 feet above the headwaters before heading out. I took a line towards the shore before turning, going for the shoreline route that usually works best for me. I have tried the inland route thinking there might be some thermals back there, and have typically been disappointed to find only sink over all those deep green ravines. But the shoreline seems to offer a nice buoyant convergence of heated land air and cool marine layer air. Or something like that. But on this day it turned out to be sinkier than usual. I just barely cleared the last fence at the ranch before the golf course and ran out a landing on the beach in front of the fourth hole. I packed up in the rough and collected the obligatory lost golf ball before hiking out to the highway. Bill landed just short of the ranch on the tip of the peninsula. Not bad for an EN-C chasing my IcePeak! Thom broke his longstanding curse and cleared Laie Point to land at Hukilau. Woody wanted to join him but played it safe and opted for Pounders. Thanks to George for the retrieve! Later, Duck and Gaza ran up to chase us but they struggled to get high enough to even think about it. Even more later, Kevin and Solar Jeff launched in the late evening breeze. Finally George launched and flew a sweet evening flight before joining the debrief session on the beach. Kevin got up and away for the last XC flight of the day, shooting back to Punaluu, and then Hauula, and Thom and I picked him up at Hauula Beack Park. His first time there! Nice flights, everybody! I look forward to many more golf course clinics. I know everyone will have their chance to land there one day. It really feels like a different corner of the island when you get to Kahuku. Plus they have the island's best poke, and tall boy torpedoes. And possibly the best Thai food! I am not sure if I coined 'the left hand turn' some time back but it was labeled in jest. I used to think nothing can be gained by getting up as high as you can, turn left and see how far your glide will get you. But as time goes on I am learning down wind legs at comps are part of the deal. Dealing with them can be perplexing, when to leave the lift, direction of line and planning ahead for any potential bumps. I have had some frustrations lately, having made Hukilau many times on wings with lesser ratings than my Aspen4. Grant it, it also depends on the conditions but more so on the mind set of the pilot controlling the lines. I have always pushed off Punaluu and Hauula straight for the waters edge with maybe a slight lean down wind. Always remembering to 'Check Penetration'. But now I find I may be pushing too much to the beach and not enough lean. I want to try the high road just once, even though Alex has stated the obvious vacuum affect of the green fingers. Maybe I will let JK go first!! In conclusion of my longish comment, Plenty can be learned from the Big Left Turn Club. I will be hitting harder and longer I hope. But keeping in mind those goals of out and back and the run to MPU from Kahana. It's Time to Fly Get Your "left blinker on" and Go!!!!!! My one sojourn with a goal of Pounders only confirms the reputation of the misleading green fingers. There was nary a pop over those low deep spines. The result was a slow sinky upwind push over the town having to keep a constant eye for the few good, but likely rotored LZs. With that flight ranking in my top 10 for inducing raw fear, it's probably why I haven't ventured back since. (Also flying a wing that is unlikely to keep up with all the superships gracing our XC routes these days keeps me nearer to the car. It's more fun flying with your buddies iff you can keep up with them.) Maybe someday I'll again hazard a left turn since now I know the better line to take from our buddies' well-woven tales. Thanks guys!